So we all know how I love to get mail, right? Not junk mail. I hate that. It makes me want to go on strike like Kramer and just never collect my mail again. But packages are totally different. So Carter was safely buckled into his car seat, I had my seat belt on, I put the car into reverse and (thankfully) *inched* backward down our driveway while backing into our turnaround. You know the whole diagonal reverse thing? When suddenly, a package...a package(!) caught my eye as it rested on the stone wall. Unbeknownst to me, as I was busy rejoicing at the package lying in wait, my foot had not positioned itself correctly on the brake pedal and we were still inching backward into our turnaround, when I heard squeaking on the side of the car. Panicked, I slammed on the brakes and shot my eyes into the back window where I was greeted by a tree, not but two inches away, seemingly ESPing to me, well that was close!! So we didn't hit the tree. The squeaky branches alerted me and saved us (well I don't know "saved us" is the correct phrase. We were probably driving at exactly 1 mile per hour, so backing into the tree wouldn't exactly have been catastrophic). But, darn you packages, for being so exciting. So what was this package, you ask? Well it was a PINCHme box of course, filled with delightful samples of every kind. This box was a success because there was a good mix of things I like (nail polish and popcorn, particularly) and things for Carter (Elmo sensitive shampoo, the popcorn--we'll fight over that later). 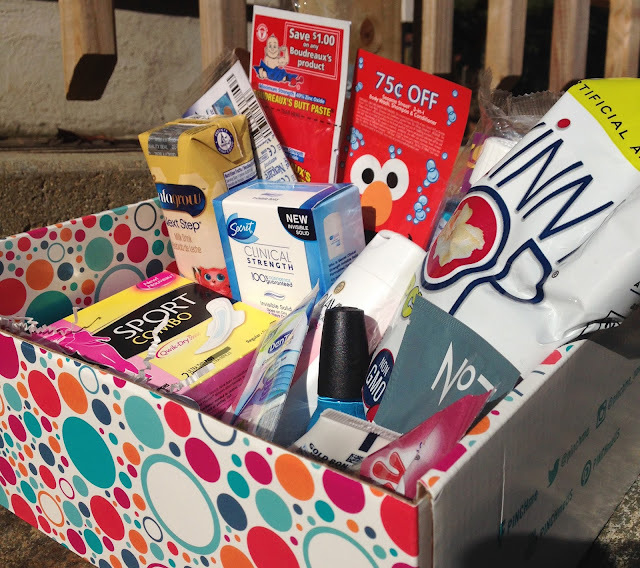 So the fun-ness of PINCHme is that it's a free sample box that comes to your door for your mail receiving pleasure. And what do they want in return? After you receive your box, you fill out a short survey with your thoughts on the products. So if you like getting packages and you have thoughts in your brain, PINCHme is for you. If you do not like getting packages and/or you do not have opinions about anything, skip it. And here was Carter being super strong and lifting the box. 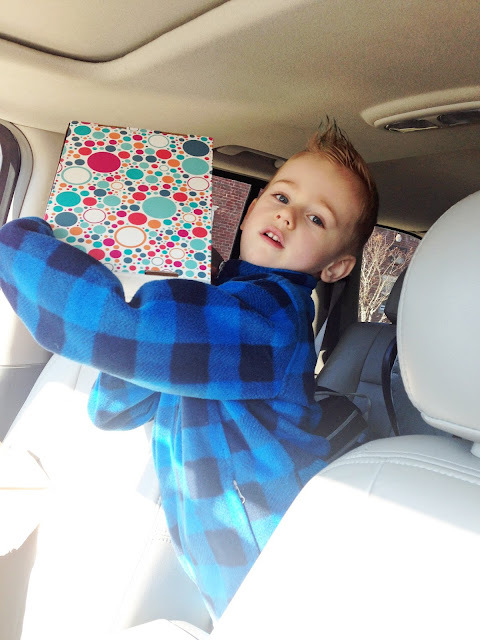 We opened it in the pre-school drop-off line because what else is there to do at drop-off?